Baltic Amber has been used for thousands of years to naturally treat the pain associated with teething, fever, migraines, arthritis and more. By using Baltic Pines amber, you can avoid giving costly over the counter pain relief medications that can affect their long term liver health. Our Baltic Amber is sourced from the Lithuania (Baltic Region) and has been tested and approved by our high standards of safety and quality to insure it’s genuine healing properties. Natural oils in the amber are released when worn next to warm skin – entering the blood stream just as topical or ingested pain medications would, and rapidly relieve pain. To prolong the use of your Amber, avoid soaps, direct sunlight, and too much water, all of which will deteriorate the stones by pulling out the natural oils that make Amber so effective. Each necklace has a safety release screw. If the necklace is pulled on, the screw will pop out and release. The thread is knotted between each bead, so should the necklace break, only one bead will be fall. These necklaces are not for chewing, playing with, or wearing while unattended this includes sleeping time. Be sure to use the appropriate size for the child using it. Do not drop amber as it can cause the beads to crack. 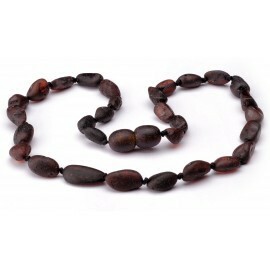 Each Baby- Toddler size necklace measures approximately 12.5″ and fits babies from 3-6 months to preschool. Fit should be snug and baby should not be able to put the necklace in their mouth, or get an arm through. If this is the case it is too big and should be removed. Due to the nature of this item, we do not accept returns on our amber. All sales are final, so be sure to ask any questions you may have prior to placing your order.